Compassion means to have intense emotions and feelings in our hearts seeing the sufferings of others, and to be willing to make sacrifices, even experience inconveniences for their welfare. God’s nature is that He is supremely compassionate: it’s only for the sake of those who are suffering in forgetfulness of him that He descends in this material world. Because we are part and parcel of God, we too have the same original nature of compassion. Therefore, as our consciousness becomes purified of material qualities, the prominent quality of the soul of being part and parcel of God’s compassion, to be an instrument of God’s compassion, becomes manifest. .
Philosophically, compassion brings real happiness. Why? Because the expression of compassion is so pleasing to the Lord, when we show compassion, the Lord is pleased and when the Lord is pleased we experience real happiness. The Vedas draw the analogy of a tree to explain this phenomenon. When we water the root of the tree, every part of the tree is nourished, and this cannot be accomplished by watering the parts of the tree separately. Similarly, the Lord being the root of all existence and we being part and parcel of the Lord, the only way to find the nourishment of real happiness is by giving pleasure to the Lord. How to reawaken this quality of compassion? There is only one way: through association, for we become what we associate with. Prabhupada gave an example to help us understand this. If we put iron rod in fire, it becomes red and hot like fire, and if you touch it, you get the same experience as you touch fire directly. When that same iron is put in ice, it becomes like ice. The law of nature is that we become like whom we associate with. When we associate with God, our godly qualities, of which compassion is a prominent one, awakens within our heart. And what is the best why to associate with God? To associating with those who love God. What amazed me was that spiritual life allows and appreciates intense emotions and feelings in our hearts. Now, who would not like to be with such a GOD who loves and understands our feelings, and emotions. Thank you Radhanath Swami for introducing us to… GOD. A compassionate person has all good ‘karmas’ on his side and he easily qualifies for Lord’s bountiful mercy. Thankyou Maharaj or your mercy of compassion on souls like us. Simple but deep realization. Something to truly meditate on. Because we are part and parcel of God, we too have the same original nature of compassion. If we understnad this one principle – God is one and everyone is his part and parcel, then then there would no more be any other fights between religious sects, between countries, between communities, between families, or between individuals..
And if we work for a common cause, then everyone can remain blissful. That common cause can be no other than God !! Thank you Radhanath maharaj for teaching us valuable lessons thru ur life and lectures.. When we associate with God, our godly qualities, of which compassion is a prominent one, awakens within our heart. And what is the best why to associate with God? To associating with those who love God. Radhanath Maharaj is d embodiment of Compassion. how to invoke real compassion is when we associate with God and persons having that quality .Thank you Maharaj. Thanks Maharaj for giving such clear understanding..
Radhanrth swami maharaj has very lucidly explained here what is compassion, what it gives, how it gives and how to awaken it…. very heart warming pic – bright faced Vaisnava boy with Maharaj! very wonderful lesson would really try to imbibe this quality in me. Nice one to realize but very very difficult unless we are so sincere in practice. what a nice picture!! sooo blissful! Thank you HH Radhanath swami for being compassionate towards all the living entities. Thank you for the wonderful advice that we can develop compassion by associating with people who are compassionate. 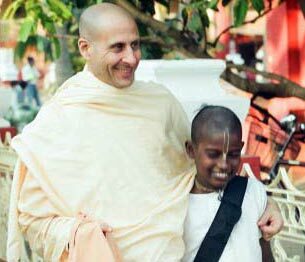 Radhanath Swami is an epitome of compassion. He teaches us by his actions. Only great souls like him can be compassionate towards all living entities which is the basis of spiritual life. Compassion means to have intense emotions and feelings in our hearts seeing the sufferings of others, and to be willing to make sacrifices, even experience inconveniences for their welfare. What a wonderful definition of compassion!